Known as the Sunshine State, Florida has something for everyone. If you love kicking back and relaxing on beautiful beaches, enjoy sampling a variety of different cuisines, dancing the night away at a wild night club or finding your inner child at the Walt Disney parks then this is the destination for you. With warm winter temperatures and scorching summers, Florida’s weather is inviting all year round. Miami is popular all year round and it’s easy to see why with tons of beach resorts, roads filled to the brim with chic fashion and shopping malls and buzzing nightlife. Every Miami beach features golden sands, clear blue water and beautiful people- like something out of a movie- so whichever one you choose, you can’t go wrong. Head to South Beach for the active bar scene with clubs such as ‘Nikki Beach Club’ and ‘Club Deep’ (dancing underwater-yeas really! 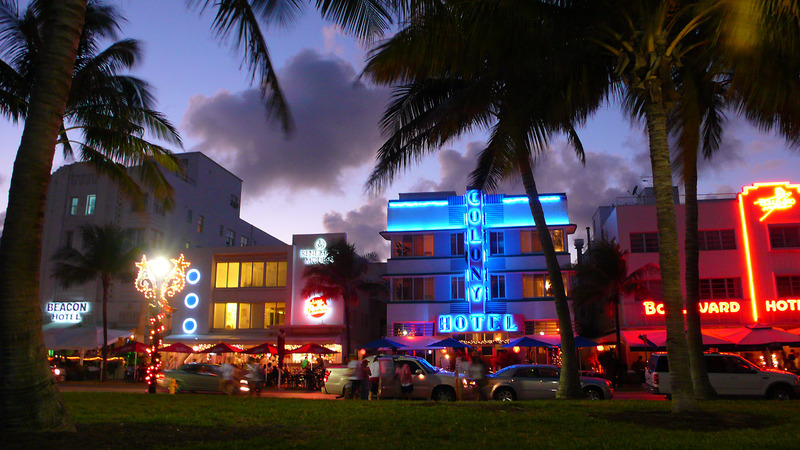 ), renowned restaurants such as ‘News Cafe’ (where breakfast is served 24 hours a day) and ‘Cuban’ and Lincoln Road shopping with stores like Victoria’s Secret, All Saints, J. Crew and Steve Madden. Viva Miami! Disney World is located in Lake Buena Vista, near Orlando and is by far the most magical and popular theme park in the world. The four theme parks to get tickets for are The Magic Kingdom where you’ll find famous rides such as Space Mountain and Cinderella’s Castle, Epcot for famous international showcases, Hollywood studios with rides such as The Tower of Terror and Pixar Palace and Animal Kingdom. The resort also boasts two heavily populated water parks; Typhoon Lagoon and Blizzard Beach which shouldn’t be missed. Disney also holds numerous hotels, restaurants, extensive shops along with plenty of different entertainment options. It really is the most magical place on Earth. The Florida Keys islands run south west from the city of Miami. They’re considered the American Caribbean with coconut trees alike and features world class fishing, scuba diving, snorkelling and kayaking for the water baby in everyone. One of the famous islands, Islamorada is known for its fishing. Take a lesson or enjoy a relaxing fishing trip on the island and don’t leave without sampling some of the local island cuisine; a variety of different fish of course. Big Pine Key Island is famous for its boating, snorkelling and diving. The island holds the stunning Looe Key coral reef which is dying to be explored so dive in. Whatever island you choose to visit, get to know the friendly locals around you. They live a relaxed, desirable lifestyle and may offer you some traditional Caribbean food and a glass of rum as a thank you for visiting the island.